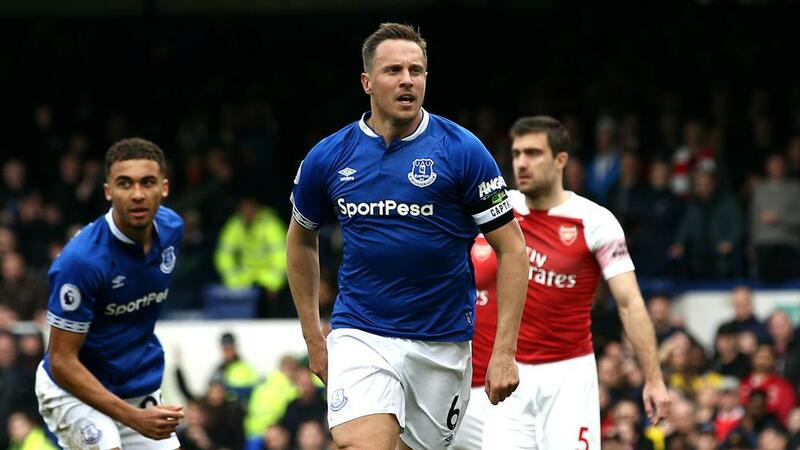 Arsenal's bid to finish in the Premier League's top four was dented on Monday (NZDT) as Phil Jagielka's early goal gave Everton a deserved 1-0 home win. Unai Emery's men could have leapfrogged Tottenham into third with a draw but will now slides back to fifth if Chelsea secures a point or more at home to West Ham on Tuesday. The defeat, its first in seven league games, was no less than deserved after a timid display that was punished when an unmarked Jagielka, in as a late replacement for the unwell Michael Keane, seized on a loose ball in the 10th minute, the 36-year-old tucking home as Arsenal's defenders appealed in vain for offside. The arrival of Aaron Ramsey at half-time led to an improved second-half showing but the Toffees capably dealt with rare defensive concerns in rising to ninth. Jagielka learned of his elevation to the XI shortly before kick-off and was soon celebrating his first goal in two years, Lucas Digne's long throw having broken kindly to him in the box. That extended a shaky Arsenal's season-long wait for an away clean sheet and their defensive stocks took a hit when Sokratis Papastathopoulos earned a booking that rules him out of games against Watford and Crystal Palace. Ramsey, who battled a groin issue during the week, stepped off the bench at the interval and quickly increased Arsenal's lean shot count. Bernard, Gylfi Sigurdsson and Richarlison all fluffed good chances to double the home side's advantage as the second half wore on, the latter especially culpable for a wayward finish with time to pick his spot. The misses ultimately mattered little, though, as Marco Silva's men held firm for a fifth clean sheet in six and third consecutive victory.